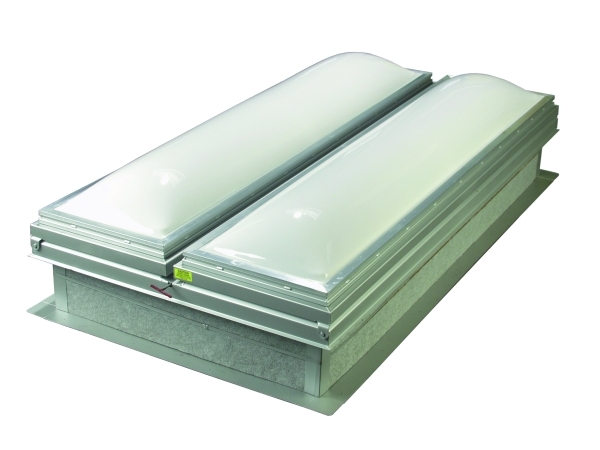 These domed smoke vents are equipped with a UL listed 165ºF fusible link for automatic operation. Certifications: The smoke vents are equipped with a UL listed 165º F fusible link for automatic operation. Construction: Dome frame is a minimum thickness of .072 aluminum and provides a self-contained sloping condensation and weepage gutter for drainage. Covers are one-piece acrylic dome (either white translucent or clear). The 14 gauge galvanized steel dome retaining frame is secured to the 14 gauge galvanized steel curb frame. The galvanized steel curb and curb frame are fully welded and ground smooth, gasketed and insulated for weather tightness. Operation: Torsion spring drives open the covers automatically. Shock absorbers control the speed of the leaves as they open. The fusible link can be quickly and easily reset and a new link inserted.